A new feature for Google Maps, which launched Wednesday, allows you to quickly find emergency alerts in your town or around the world. Called Google Public Alerts, the new feature draws on weather, public safety, and earthquake alerts from federal agencies to supplement Google Map searches. 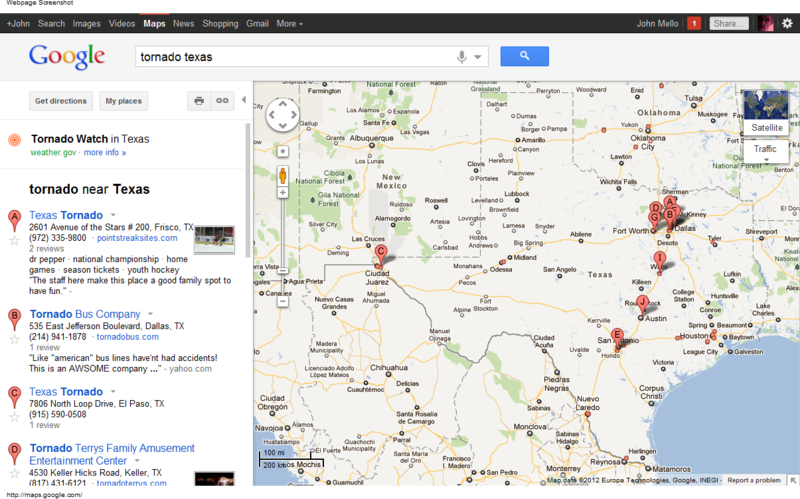 For example, if you search for "Texas tornado" in Google Maps, at the top of the search results beside the map is a link to an emergency alert from the National Weather Service concerning twister activity in the Lone Star State. You can see more information about the alert by clicking the "more information" link below it. 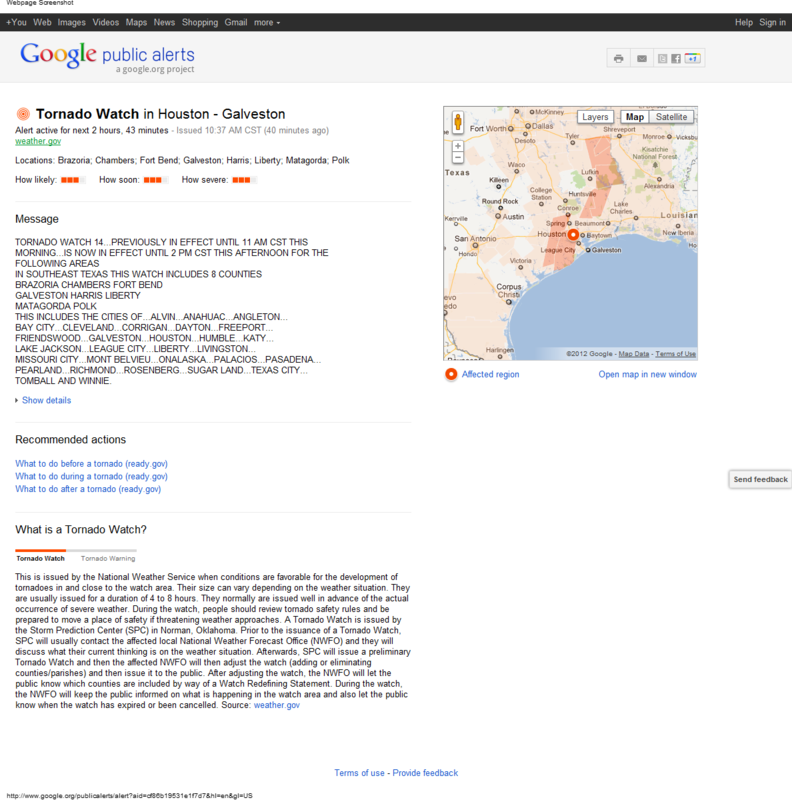 In this case, the link takes you to a Google Alerts page that displays the text of the alert and a local map of the affected area. Whether or not an alert will appear in the results column depends on activity at a location, severity of the alert, and the wording of the search query. If you're curious about emergencies outside your local area, you can go to the landing page for Public Alerts. There you can see where alerts have been sounded around the world by allowing your cursor to hover over any orange circle on the map. When you do that, a summary of the alert appears in a pop-up box. Clicking the circle displays a fixed box with a link to the source of the alert. 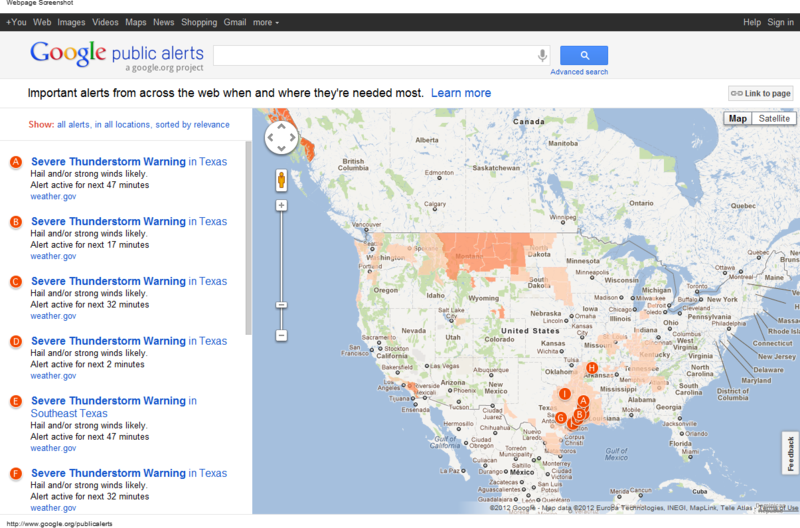 In addition to following disaster activity around the world, the Public Alerts page provides emergency responders with instructions for including alerts from their agencies in Google Maps with the new tool.